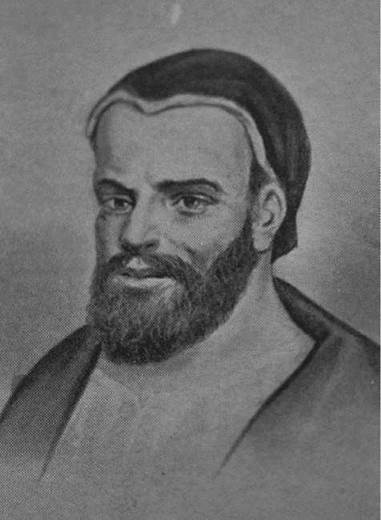 Francois Rabelais. Rabelais, Francois, photograph. The Library of Congress. A Renaissance monk, physician, and scholar, Francois Rabelais is best remembered today for his Gargantua and Pantagruel (1532-1564), a multivolume narrative comprising comedy, satire, myth, and humanist philosophy and detailing the epic stories of two giants’ upbringing, ribald adventures, and journeys toward self-discovery. A prominent influence on writers from Laurence sterne to James Joyce, Rabelais has been described as ‘‘the miracle of the sixteenth century’’ by Anatole France, and is often considered the French equivalent of William Shakespeare and one of the half-dozen or so giants of world literature. Discovery and Confiscation of Secretly Acquired Texts. Although important dates and biographical events of his life remain uncertain, it is believed that Rabelais was born around 1494 into a wealthy family in Chinon and was tutored at home as a child. He received a formal education at a Franciscan monastery in Poitou. Despite imposition of a severely confined curriculum there, Rabelais and a fellow monk began to independently study many of the Latin, Greek, and Hebrew classics prohibited by the Church. Acquiring in a short time considerable knowledge of secular history, myth, and humanist thought, Rabelais began composing letters in a mixture of Latin and Greek to Guillaume Bude and Desiderius Erasmus, Christian humanists whom he admired for their forthright views and unwillingness to bow to Church dogmatism. He also completed at this time Latin translations of the Greek satires of Lucian, a writer whose style and imagination markedly influenced Rabelais’s later prose. Yet, with the monastery’s discovery and confiscation of his secretly acquired classical texts, Rabelais’s pursuit of scholarly interests as well as his monastic career were seriously threatened. Fortunately, he received the patronage and protection of a high-ranking friend, Bishop Geoffroy d’Estissac, who accepted Rabelais into the Benedictine order at Saint-Pierre-de-Maillzeais in 1524. Travel and Career as a Physician. As d’Estissac’s secretary, Rabelais traveled with the bishop throughout his diocese and became intimately acquainted with rural peoples, acquiring a keen ear for rustic dialects, popular tales, and an appreciation of simple existence—all of which heavily imbued his fictional world. Following two years under d’Estissac, Rabelais set out on his own as a secular priest and aspiring physician who traveled about France teaching and studying. In 1530 he entered the widely esteemed University of Montpellier, where he obtained a medical degree. He soon gained renown as a talented lecturer, doctor, and editor-translator of works by the Greek physicians Hippocrates and Galen, proving instrumental in reviving and incorporating their theories into contemporary medical practice. Because of his reputation and accomplishments in the field, Rabelais was appointed chief physician in 1532 to the well-known Hotel Dieu in Lyon. Pantagruel: A Sudden Switch in Literary Attention. After editing further Latin and Greek texts that year, Rabelais surprised his colleagues by composing and publishing an apparently frivolous narrative in French, a language that at the time was considered undignified, even vulgar, by the Latin-oriented Church and aristocracy. There has been much speculation as to why Rabelais so suddenly switched his literary attention; some thought there was a strictly financial motivation due to personal financial problems while others believed that he had yearned for some time to unleash his convivial wit, cherished by patients, students, and friends in order to entertain as well as educate a wider audience. In any event, Pantagruel, King of the Dipsodes, with His Heroic Acts and Prowesses (1532) proved a huge, instantaneous success. First appearing at the annual Lyons fair, and modeled after a recently published, popular chapbook tale of Arthurian giants (Les grandes et inestimables chroniques du grand et enorme geant Gargantua), Rabelais’s work met with a captive readership, particularly as Pantagruel, unlike its predecessor, contained allusions to current events and more vividly portrayed human life under the humorous guise of gianthood—a fantastic realm then in vogue with French readers. This work was soon revised and expanded and accompanied by two shorter works: ludicrous astronomical predictions by Rabelais’s narrator Alcofribas Nasier (an anagram of the author’s name) for 1533 and 1534. Allusions and Allegories in Later Writing. In October of 1533, Pantagruel was denounced by the Sorbonne for excessive obscenity; however, no immediate restrictions were placed on Rabelais. Early the next year Rabelais left Lyons for Rome as companion and personal physician to bishop and diplomat Jean du Bellay. For the next decade Rabelais periodically assisted du Bellay and his brother Guillaume, governor of the Piedmont region of Italy, in various capacities. Primarily, he served as family physician and intermediary in attempts to reconcile Catholic and Protestant factions, who had been at odds since German monk Martin Luther’s revolutionary pronouncements against abuses by the Roman Catholic Church in 1517 sparked the Protestant Reformation. Between his travels and official service Rabelais continued to practice and study medicine. He also honed and expanded his literary skills, publishing sequels to Pantagruel in 1534, 1546, and 1552. The first of these, The Inestimable Life of the Great Gargantua, Father of Pantagruel, represents Rabelais’s attempt to re-create the myth of Gargantua, father of his first fictive hero. Due to the chronological precedence of its story Gargantua has been placed first in sequence by editors of Rabelais’s work. Next came the Third and Fourth books, the last to be positively attributed to Rabelais; in these works, the giant element is downplayed and a greater emphasis is placed on the quest for truth and meaning in life. More complex in structure, more copious in allusion and ambiguity, these later books greatly contributed to Rabelais’s posthumous reputation as a profound thinker and allegorist. All four books, at the time, were condemned by the Sorbonne, whose members thought Rabelais an immoral Lutheran sympathizer. Rabelais was also censured by the extreme Protestant wing of the Calvinists, who deemed him a dangerous proponent of atheistic values. Despite such religious opposition, Gargantua and Pantagruel remained immensely popular with a wide cross-section of people, from liberal intellectuals to marginally educated laboring classes. Due to Rabelais’s several influential acquaintances, the publication and sale of his books were protected by royal edict; however, it is believed that Rabelais was occasionally hounded by various religious authorities because of his works and was forced, from time to time, to leave the country. Last Years and Unsolved Mysteries. In his last years, Rabelais was granted religious offices at Meudon and Saint-Christophe-du-Jambet through the patronage of Jean du Bellay. He resigned these offices for unknown reasons in 1553 and died shortly thereafter. Nine years later The Ringing Island (1562) appeared in print under Rabelais’s name. The majority of scholars recognize this work as a largely authentic continuation of the Pantagruel story. This publication was followed by The Fifth and Last Book of the Heroic Deeds and Sayings of the Good Pantagruel (1564), which included The Ringing Island as its first sixteen chapters. The authenticity of the latter portion of this work, given its predominantly unrelieved moralistic tenor, has been seriously questioned, and the issue remains unresolved. Francisco Pizarro (1471-1541): Spanish conquistador and conqueror of the Inca. The year that Pantagruel was published, Pizarro landed in Peru; within a year, the Incan emperor was dead and Pizarro was master of the former empire. Suleiman I (1494-1566): Called ''the Magnificent" and ''the Lawgiver,'' Suleiman was sultan of the Ottoman Empire from 1520 to 1566, during which time the empire reached its zenith in political, military, and economic power. Anne Boleyn (1501-1536): The second wife of King Henry VIII of England, Anne Boleyn was infamously beheaded in the Tower of London after failing to provide Henry with a male heir. Niccolo Machiavelli (1469-1527): Italian diplomat best known for his works of political philosophy, most notably The Prince. His emphasis on realistic appraisal of political gain, and the often cutthroat means needed to achieve it, led to the term Machiavellian. Ironically, the book was not published until after Machiavelli's death and is not representative of his writings during his lifetime. Nostradamus (1503-1566): Michel de Nostradame— remembered today by his Latinized pen name—was a French apothecary, or pharmacist, who claimed to have prophetic vision. His Prophecies, made up of one thousand quatrains written in obscure, arcane riddles, have been claimed by many to predict a variety of major historical events in the ensuing centuries. The difficulty of interpreting Rabelais’s work is made apparent by the wide-ranging, conflicting analyses it has received. Some critics perceive a dominant comic element, others a decidedly satiric strain, and still others a comprehensive fictional plan that incorporates these and other elements in a highly individual, joyful affirmation of humanity. What can be agreed upon by most scholars is that Gargantua and Pantagruel is an overwhelmingly rich and complex narrative mosaic that contains references to Greek philosophy and the Bible, relentless linguistic experimentation, Christian humanism, and an underlying Renaissance concern with the spiritual and intellectual perfection of the individual. Low Humor and High Concepts. There is a central division in Rabelais’s work between wise, occasionally profound prose and superficial, rollicking entertainment. Through modern analyses, scholars have shown that despite several bawdy, off-color episodes and seemingly aimless, digressive language, Gargantua does move gradually toward higher concerns. In the closing chapter to Book II, Gargantua builds a religious abbey for his aide and confidante Friar Jean. The abbey, for its rules reinforcing equality and adoption of Renaissance principles of education and open-mindedness, is regarded as Rabelais’s idealized conception of a new world order. The inscription on one of its cornerstones (‘‘Do what thou wilt’’) combined with an emphasis on responsible, active participation in God’s community on earth, represent ideals that Rabelais returns to throughout the novel in various ways, often cloaking his humanist beliefs in irony, humor, and allegory. A Master of Language. Central to Rabelais’s artistic world, and to his humanist conception of life, was the potency, magic, and unlimited appeal of human language itself. Often compared to prose experimentalist James Joyce, Rabelais released in his books a pyrotechnical display of verbal constructs and linguistic games widely considered excelled only by those of Finnegans Wake (1939). Yet such inventiveness, and a purported inattention to plot and relevant detail, has provoked some harsh criticism of his work. Many sixteenth- and seventeenth- century scholars took his ribald, seemingly amoral humor and madcap verbiage at face value, and labeled the author a drunken fool with a prolific, profane pen rather than a serious writer with a uniquely organized and effectively expressed message for the world. However, most later critics acknowledge the serious intent of Gargantua and Pantagruel and accept the wordplay, circuitous narrative, and occasional grossness as the natural outpourings of a literary genius artistically intoxicated with life at its fullest, and language at its richest. Rabelais has exerted influence over a wide range of authors including Laurence Sterne, James Joyce, Jonathan Swift, Anatole France, John Cowper Powys, D. B. Wyndham Lewis, Lucien Febvre, Aleister Crowley, Milan Kundera, Robertson Davies, and Maria Theotoky, among others. Finnegans Wake (1939), a novel by James Joyce. Seventeen years in the making, Joyce's last novel remains controversial to this day due to its combination of stream-of-consciousness style and literary and linguistic allusions, along with a complete lack of traditional conceptions of plot and character development. Zazie in the Metro (1959), a novel by Raymond Queneau. The French language remains, in its standard form, highly structured and regulated. Queneau's novel is written entirely in a nonstandard, "colloquial" form. Tarantula (1966), an experimental novel by Bob Dylan. Part poem, part novel, Dylan's stream-of-consciousness work is as challenging and impenetrable as his song lyrics from the same time. Scarron, but classical writers, with the exception of Moliere and Jean de La Fontaine, were generally less enthusiastic. Jean de La Bruyere called Rabelais’s works ‘‘a monstrous assemblage of fine and ingenious morality and filthy corruption.’’ Voltaire criticized his ‘‘miserable use’’ of his wit. Rescued by the Romantics. Rabelais’s critical fortunes improved dramatically in the nineteenth century, when Romantic writers and critics—enamored of the past, and with a penchant for verbal excess and the grotesque imagination—labeled Rabelais a literary genius. This view has endured in modern times, as evidenced by the wealth of scholarship focused on his texts, and by his influence on authors as diverse as Louis-Ferdinand Celine, Raymond Queneau, and James Joyce. Much earlier than Joyce and before Thomas Urquhart’s first translations in 1653, English-speaking readers discovered and came to love Rabelais. According to the Old English Dictionary, the terms Gargantuist and gargantuan date from the end of the sixteenth century. Early modern writers including Sir Philip Sidney, Francis Bacon, Ben Jonson, and John Donne either refer to or quote Rabelais, and his influence on Laurence Sterne’s Tristram Shandy (1759) and on Jonathan Swift’s Gulliver’s Travels (1726) is widely acknowledged. 1. Summarize the spirited philosophy of the Abbey of Theleme in a short essay. How did it differ from real- world abbeys of Rabelais’s time? 2. Cite examples of Rabelaisian forms of humor, including pun, jest, joke, satire, hyperbole, sight gag, and incongruity. What are some examples from modern movies or books that use similar forms of humor? 3. Rabelais angered both Catholics and Protestants, albeit for different reasons. Summarize and explain why he was so hated. Why do you think Rabelais rebelled against his Catholic peers’ conservatism? 4. Rabelais’s maxim ‘‘Do what thou wilt’’ was later taken up by infamous twentieth-century occultist Aleister Crowley as his personal credo. He stated, ‘‘‘Do as thou wilt’ shall be the whole of the law.’’ Do you agree with this? What are the advantages and disadvantages to letting everyone do what they please? Chappell, A. F. ‘‘The Enigma of Rabelais: An Essay in Interpretation.’’ DISCovering Authors. Online ed. Detroit: Gale, 2003. Chesney, Elizabeth A. The Countervoyage of Rabelais and Ariosto: A Comparative Reading of Two Renaissance Mock Epics. Durham, N.C.: Duke University Press, 1982. Coleman, Dorothy Gabe. Rabelais: A Critical Study in Prose Fiction. Cambridge, U.K.: Cambridge University Press, 1971. Conway, Megan, ed. Dictionary of Literary Biography, Volume 327: Sixteenth-Century French Writers. A Bruccoli Clark Layman Book. Louisiana State University-Shreveport, Detroit: Gale, 2007. Kinser, Samuel. Rabelais’s Carnival. Berkeley: University of California Press, 1990. ‘‘Rabelais, Franyois (c. 1494-1553).’’ DISCovering Authors. Online ed. Detroit: Gale, 2003. Saintsbury, George. ‘‘Rabelais.’’ DISCovering Authors. Online ed. Detroit: Gale, 2003. Spitzer, Leo. ‘‘The Works of Rabelais.’’ DISCovering Authors. Online ed. Detroit: Gale, 2003. ‘‘Study Questions for Francois Rabelais.’’ DISCovering Authors. Online ed. Detroit: Gale, 2003.